A recently published illustrated manual on gnotobiotic mouse technology could be a great help to developing common standards in the germ-free research community. Chriss J. Vowles, Natalie E. Anderson, and Kathryn A. Eaton of the University of Michigan have produced a thorough reference in Gnotobiotic Mouse Technology: An Illustrated Guide (CRC Press). The Guide features an overview of germ-free research history with sections on sterilization, testing, rederivation, isolator equipment, and personal protective equipment (PPE). Also included are photos illustrating the different types of isolators and caging used plus a demonstration of how to put on sterile PPE. The chapter on isolator setup is very comprehensive, with 60 pages of step-by-step instructions and photos documenting the process of setting up both small and large bubble isolators. There is a section on sterilization which includes a discussion of which sterilization method to use for different types of materials. Short-term housing of gnotobiotic mice in class II biosafety cabinets provides for easier experimental manipulation of gnotobiotic mice, but introduces challenges to maintaining sterility. The Guide addresses this with a clear best practice recommendations for the handling and transport of gnotobiotic mouse models, as well as a section on how to introduce and work with materials and mice in the biosafety cabinet. The chapter on transport of mice between laboratories describes the use of the Taconic germ-free shipping container, with step-by-step instructions for how to connect the shipper to the source isolator and appropriately pack and seal the shipper. A short chapter on rederivation covers the basics of cesarean derivation, as well as surgical and non-surgical embryo transfer. Additionally, the section on microbiological testing is a particularly useful reference, with a discussion of various testing methods, with pros and cons for culture testing, Gram staining, and PCR (polymerase chain reaction) testing and detailed protocols for contamination screening. Readers may find the library of photomicrographs to be a helpful reference when interpreting Gram stain samples. The final chapter will be of interest to anyone considering setting up a new gnotobiotic facility. The authors address practical concerns -- such as space requirements and funding -- as well as the recruitment, selection, and retention of staff. 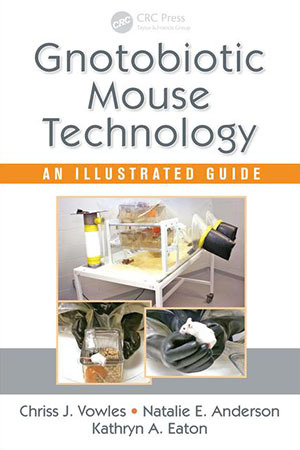 Gnotobiotic Mouse Technology: An Illustrated Guide is a valuable tool for both experienced and new gnotobiotic researchers. The detailed protocols, materials list, and photographs make germ-free research more accessible. By pulling back the curtain on the mysterious world of germ-free mice, the authors have done the research community a great service.